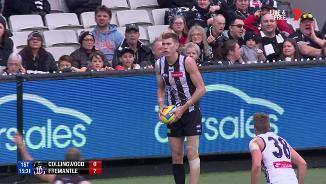 Collingwood's dominance in the middle part of the game setup their win today. They won the contested possession (151126), inside 50's (62-35) and launched 8 more goals from intercepts. Collingwood have launched a goal from 50 per cent of clearances in this quarter. In total, their have been 14 goals in a very attacking last quarter. Dockers InterchangeLuke Ryan off due to an injury. In this quarter, their have been 6 goals from stoppages in total. All together, their have been 14 goals from this source today. Will HoskinElliot now has a career high 6 goals. Tom Phillips has been one of Collingwood's best today with a gamehigh 486 metres gained and 22 contested possessions. Fremantle have been competitive at scoring from centre clearances. They have won 12 centre bounce clearances and launched 3 goals from this source. In this second half, Collingwood has created 21 intercepts in their midfield and generated 5 goals from this source. Since quarter time, Collingwood have had 68 per cent time in forward half and 57 per cent time in possession. In that quarter, the Magpies won the inside 50's (185) and uncontested possessions. They benefited from their 21 intercepts, launching 4.1.25 from this source. Fremantle's quick ball movement from stoppages has been their only source of goals today. They have had 3 of their goals sourced from 28 clearances. Collingwood have had the last 8 inside 50's of which 6 have come from turnovers. They have been extremely efficient going inside 50 creating a goal from 50 per cent of these entries. The Magpies have now launched 8 inside 50's from 16 midfield intercepts in this quarter, resulting in 2 goals. Michael Walters has been one of Fremantle's more influential players with a team high 297 metres gained, 5 clearances and 3 inside 50's. Fremantle has launched 2.2.14 from their attacking midfield. However, they have had just 13 chains sourced from this zone compared to 24 for Collingwood. The Magpies hold 86 per cent time in forward half in this quarter. They have launched 5 inside 50's from 8 attacking midfield chains and now have their first goal of the quarter. Dockers InterchangeConnor Blakely off due to an injury. Collingwood have applied superior pressure in this quarter (10 tackles to 3) and it has paid dividends with the first four inside 50's. Dockers InterchangeAlex Pearce and is possibly out for the game. Collingwood now lead the clearances (2011), generating 8 scores from this source. They have been led by Taylor Adams with a game high 6 score involvements and 7 clearances. Collingwood is dominating the time in forward half (58 percent), clearances (64) and inside 50's (13-5). They are starting to get their reward with 3 goals to 1 for the quarter. Collingwood have created 9 intercepts in their midfield this quarter, but have use the ball poorly in their attacking half. Their kicking efficiency is just 58 per cent and they have no marks inside 50 (from 9 entries). 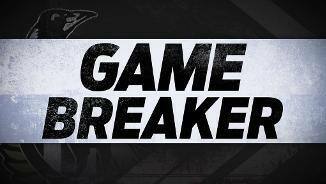 Jordan De Goey has had 3 score assists already and Tom Phillips has a game high 268 metres gained and 18 possessions. Collingwood have had 6 of the first 7 inside 50's for this quarter. They have launched 5 of these from the attacking midfield, where they have created 5 intercepts. Fremantle are struggling to transition from their defensive half, creating just 3 inside 50's from 16 defensive half chains. In a similar start to the first quarter, Fremantle is winning the uncontested possessions (123) and has had 80 per cent time in possession. In that quarter, Collingwood won the clearances (83) around the ground. This enabled them to launch 8 inside 50's and 2.4.16 from this source. As mentioned before the game, Fremantle are susceptible to defensive half transitions. Collingwood has already launched 4 inside 50's from 8 defensive midfield chains, resulting in 3 scores. Fremantle are using the ball more effectively in their forward half with a kicking efficiency of 71 per cent compared to 39 per cent for Collingwood. 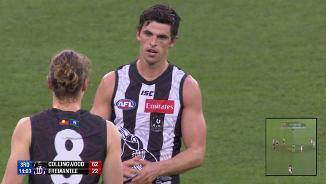 In the last 10 minutes, Collingwood has had 65 per cent time in forward half and 6 inside 50's to 2. They have launched 3 scores from stoppages in this time. The Magpies have won 5 of the last 7 clearances and are also leading the contested possessions (1612).Tom Phillips has 3 of these clearances. 5 of the first 6 inside 50's have been sourced from stoppages in this game and both sides have a goal from this source. The Dockers are dominating the uncontested possession count (182) and using the ball well early (91 per cent kicking efficiency). 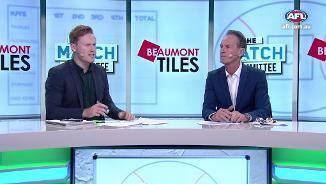 The Dockers have conceded an inside 50 from 45 per cent of their oppositions defensive midfield chains, which has them ranked 18th. Collingwood has generated an inside 50 from 24 per cent of its defensive 50 chains this season. This has them ranked third in the competition. Welcome to MCG for the Collingwood v Fremantle Round 11 clash. 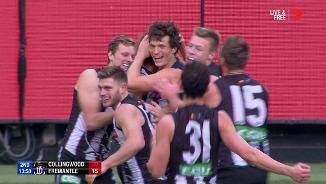 COLLINGWOOD has set the stage for an enticing Queen's Birthday showdown with Melbourne, destroying an inexperienced Fremantle side by 61 points to win its third game on the trot and cement its place in the AFL's top eight. The Magpies thoroughly outclassed the Dockers after quarter-time at the MCG on Sunday, building an insurmountable 34-point lead at half-time and finishing the job to run out 21.12 (138) to 12.5 (77) victors. 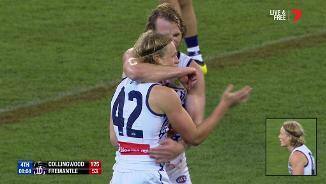 Fremantle’s loss could be further compounded with Brownlow Medal favourite Nat Fyfe set to come under match review scrutiny for a high hit on Collingwood’s Levi Greenwood. Collingwood's work rate, especially through the arcs, was the big difference between the teams, with the Magpies' best runners Tom Phillips (35 disposals, three goals and 596m gained) and Steele Sidebottom (37) influential in the big win. Both Phillips and Sidebottom run around the six-minute mark over 2km, which is considered at the top echelon of elite, and their ability to cover the ground in such a dominant manner was telling. Mature-age debutant Brody Mihocek made a sizeable impact in the second quarter, kicking his first goal and being used as an important link between defence and attack. Mihocek, 25, who played for three VFL clubs and made the move from Tasmania after being overlooked in his under-18 year, is a great example of a player being rewarded for his persistence as the first-gamer finished with four majors. After missing a month with an ankle complaint, Brayden Maynard (27 touches) also settled nicely back into an underrated defence that has kept its opponents to an average of 67.5 points over the past four weeks. Will Hoskin-Elliott (six goals) continued his superb season and kept alive his streak of being one of only two players in the competition (alongside Melbourne's Jesse Hogan) to kick a goal in every match this season. Move over Undertaker: the streak continues! 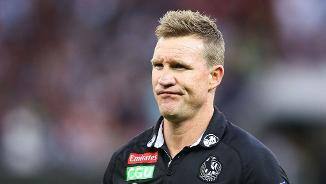 Collingwood booted its highest score (138) since round eight, 2016, but coach Nathan Buckley was disappointed the Magpies allowed the Dockers to kick seven goals in the final term. "You don't see 20 goals in a game as often as you used to, but our offensive power especially after quarter-time was pretty strong. We scored relative to our entries pretty well so that was a positive part of the game," Buckley said. 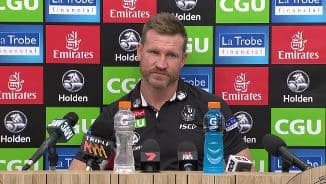 "I'm pretty dirty with the last 15 (minutes) at the moment so if you're talking about defence you want to finish the game off, but it was a shootout really the whole of the last quarter, which is not the way that we want to play the game. But the first three quarters we were really strong defensively." Without Aaron Sandilands, who missed the game with concussion, Fremantle's midfield ascendancy was stunted and with Fyfe (24) having a quiet day the Dockers lacked spark. 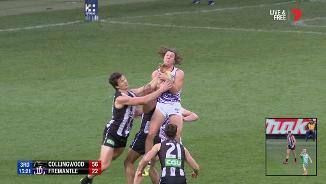 Depending on how Match Review Officer Michael Christian views it, Fyfe could be in strife for the incident with Greenwood. 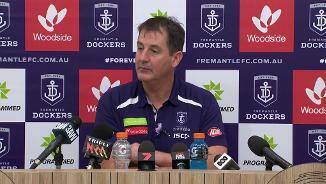 After Ross Lyon wielded the axe by making six changes at the selection table, Fremantle lost 1091 games of experience from last week and it was significant in the narrative of the game. 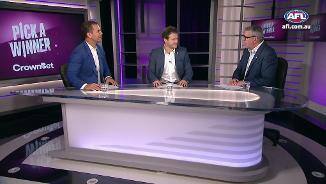 Lyon said the Dockers' match committee would persist with their policy to give their youth opportunities. "AFL is a great reality check. You can come here with the intent and enthusiasm to compete, but the realities of the game are very sobering," Lyon said. "To do what we did and kick seven goals in the last quarter, if I'm sitting back in Perth and I'm a member and part of the Docker community … there were some performances within that show we are growing and improving." Fremantle lacked impetus forward of centre and managed just five goals to three-quarter-time, in what turned into a beatdown once the Magpies clamped down on the Dockers' copious amounts of uncontested marks. With the Dockers' midfield being well beaten, Fremantle's defence eventually buckled under the weight of an avalanche of inside 50s (62-35). Michael Walters (29 disposals and nine clearances) was clearly Fremantle's best player, while youngsters Ed Langdon and Andrew Brayshaw tried hard and debutants Stefan Giro and Scott Jones got consolation prizes late in the game. Next Monday will provide a significant test for Collingwood against the AFL's hottest team in the Demons and it could provide a true indication of where the Magpies sit in the finals pecking order. 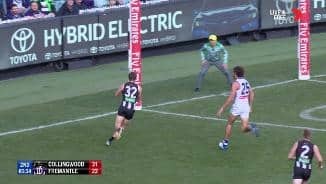 Collingwood: Magpie Steele Sidebottom copped a hefty corkie to his left leg in the final term, but stayed on the field and played out the game. Fremantle: Michael Walters left the field in the second term with a corkie to his right calf. Defender Alex Pearce got his right ankle caught underneath him in a tackle and was helped from the field by trainers. 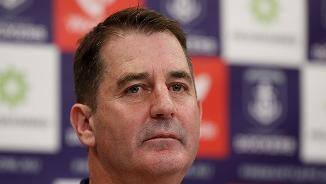 He took no further part in the contest, but coach Ross Lyon is hopeful the injury is not significant. Connor Blakely injured his shoulder in the third term, but played out the game. Lachie Neale copped a significant kick to his calf in the first quarter but battled on to play out the game. 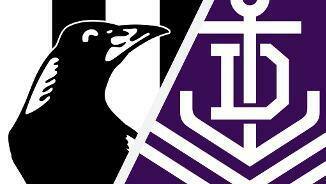 The Magpies will have an eight-day break before coming up against Melbourne, which has won six games in a row. The Dockers return home to face Adelaide at Optus Stadium.